My custom tarot deck arrived today. 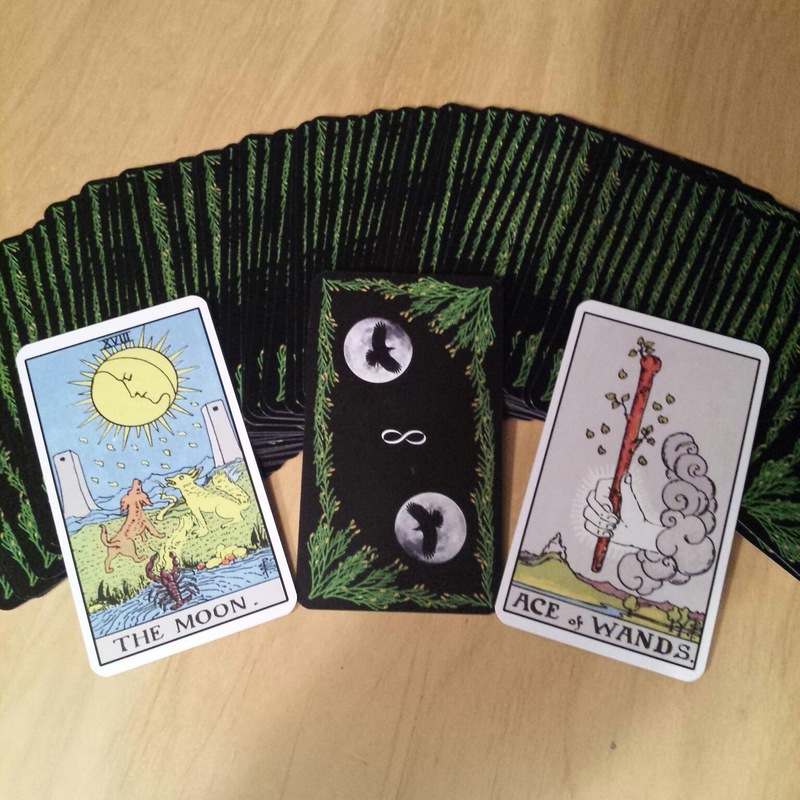 It was a small investment in time and money to have a personalized tarot deck. Overall, I'm happy with the result. Found the website www.makeplayingcards.com and started a project for a 78 card tarot deck. Designed a custom back that would reflect Cedar, Crow, and Moon. I used GIMP to do all the graphics editing. The key to this was making the image identical whether it was upside down or right side up so that you can't distinguish when a card is upright or reversed. The top and bottom halves are mirror images. I had to do a little trick to make the cedar branches overlapping be the same on the top and bottom half. Basically, I cut a small square of the top image bottom right corner, pasted it in a separate layer, and then moved that layer so that it overlapped the same way as the branches coming up from the bottom half. If you're interested in details, let me know and maybe I'll do a brief video. Since I use the traditional Rider-Waite-Smith tarot cards, I'm in luck. All the images are public domain and carry no copyright. So taking all the images, one by one I created a new image with each card centered and bordered. I then uploaded each of the cards to the Make Playing Cards website. After I reviewed the project, I sent my order in. $16 for the deck. $10 for shipping. If I were buying many to sell the price would have been better per deck, but $26 for a custom deck isn't that bad. The quality of the cards aren't as nice as my US Games deck, but they are still decent. We'll see how they hold up after a little bit of use. I'll probably use my US Games deck for study and personal readings and my custom deck when I do readings for others. I know many of you create your own designs for decks and perhaps this is a cost effective way to have your work made into an actual deck. If you have ever done a custom deck before, I'd love to hear how you did it.